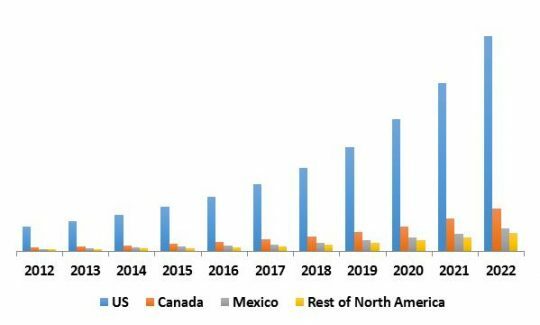 According to a new report North America Automatic Content Recognition Market, the market is expected to attain a market size of $17.8 billion by 2022, growing at a CAGR of 26.8% during the forecast period. This growing consumers appetite for interactivity opens opportunities for broadcasters, content owners and advertising agencies to deepen their relationship with the consumer. Adding interactive applications to companion devices and smart TVs meets the demands of todays media consumers and offers new monetization opportunities for targeted applications and advertising. Automatic Content Recognition will power the majority of these next generation interactive applications. Real-time audience measurement metrics are now achievable by applying Automatic Content Recognition technology into smart TVs, set top boxes and mobile devices such as smart phones and tables. This measurement data is highly essential to quantify audience consumption to set advertising pricing policies. In 2015, US dominated the North America Automatic Content Recognition Market. The Country has registered revenue of $2.6 billion in 2015. 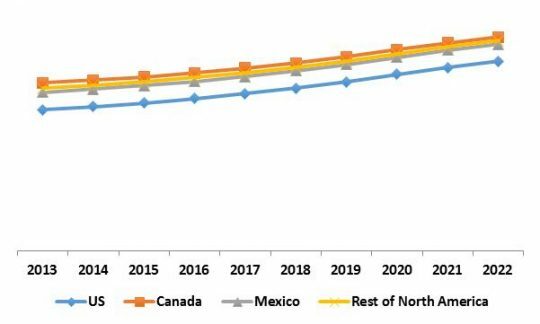 The Canada market is expected to grow at the fastest growth rate of 29.7% CAGR during the forecast period. Based on type, the North America Automatic Content Recognition market is bifurcated into Solution and services segment. Solutions are the major revenue contributor in North America Automatic Content Recognition market. Solution Segment is further divided into Audio, Video & Image Recognition, Voice & Speech Recognition, Real Time Content Analytics, Security & Copyright Management, Data Management & Metadata, Content Aggregation, Processing, Filtering & Enhancement, Encoding & Transcoding Solution, Broadcast & Media Monitoring, Media Synchronization and Audience Measurement. In 2015, Audio, Video & Image Recognition was the dominating segment. However, Broadcast & Media Monitoring would witness maximum CAGR of 30.8% during the forecast period. Telecommunication, Healthcare, Defense & Public Safety, Avionics and Others. The report has exhaustive quantitative insights providing a clear picture of the market potential in various segments across the countries in North America region. The key influencing factors of the North America Automatic Content Recognition market have been discussed in the report along with the elaborated company profiles Microsoft Corporation, Google Inc. (Alphabet Inc.), Nuance Communications, Inc., Digimarc Corporation, Shazam Entertainment Limited, ArcSoft, Inc., Enswers Inc. and Doreso.